If you've been thinking about pre-ordering your TouchPad in this final week before the official launch date, you might first want to read what other users have experienced as they've done the same. User dajlol77 has shared their experience here, with a nice bit of detail, and asked other members of our forums to do the same. Of course, you could just take the easy route and order it online through HP's website, but what's the fun in that? Before putting in their own pre-order, re2st is wondering what to do about the lack of GPS on the Wifi only version of the TouchPad that is being released first. Will it be that big of a problem to not have GPS on the device when you already have it on your phone (and can even purchse NDrive, which requires no data connection at all to work)? Or should they wait until the 3G version of the TouchPad is released later this summer? Several users share their thoughts on the matter, and even talk about experiences with a Wifi only iPad, to help give the answer to everyone who's wondering the same thing. In just a few days, webOS developers and fans will be uniting in New York City to talk about their latest app projects, device tips, community discussions and of course, the soon-to-be-launched TouchPad. It's all going down on the 28th, and they've set up a thread to discuss it here. Our very own Jonathan Ezor will be co-hosting the event, so you can bet it'll be one you don't want to miss if you're in the NYC area. Lastly, for those of you who have commented on the "lag" that shows in TouchPad demo videos of old, user blinktreo has started a thread to share evidence that the device that is being built and shipped to consumers is anything but laggy. He's gathered together a number of videos and demos that have appeared over the last few weeks, and opens the thread for comments on how people are expecting the TouchPad to act once delivered. We'll leave it to you to join that discussion and read other opinions, but we like that idea of a fast and snappy device ready for release on July 1st. 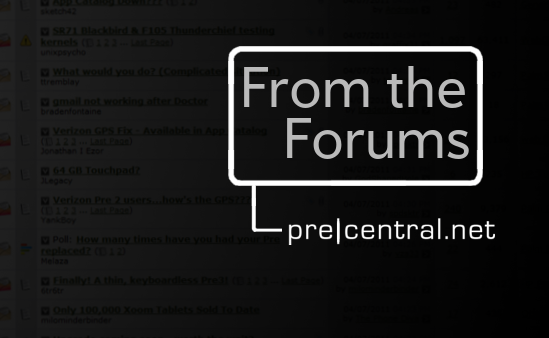 The PreCentral forums are ripe for discussion and a great place to talk with other webOS users and fans. You can register for free and get started by clicking that link in our menu. Don't forget to share your favorite threads with us at tim@precentral.net, we'll try to add them into the next From the Forums post next week!